Shane Lowry and Padraig Harrington had another of their short game contests at Whistling Straits. Victory on this occasion went to the the senior player. Shane Lowry might have his PGA Tour card in the bag but the man from the Faithful County has vowed to remain true to Ireland. Like Padraig Harrington, he won’t move to US and buy a house in Florida because he loves living in Ireland too much. Harrington was “thrilled” to see Lowry won the WGC-Bridgestone Invitational on Sunday and like Darren Clarke, he’s convinced the Clara ace can win a major sooner rather than later. Recalling how Lowry won the Irish Open as an amateur in his first pro start, Harri said: “Shane likes skipping things. It is incredible. “And if you can win a world event, you can win a major. In fact, he is unlucky that it is not a Major because the standard of the golf course and the standard of the field is every bit the same. “Can he win a major now? Yes, he is capable of doing it. You would still think in the natural progression of things he will lose a couple before he goes and wins one, but Shane has never done that. “It hasn’t bothered him in the past, so I wouldn’t be living by that rule and to be honest very few people in golf live by any rule now. Lowry has played more in the US this year and now that he has his PGA Tour card, Harrington is delighted to have a regular buddy in the US. Harrington beamed: “I think that’s going to be a great move for me that Shane is coming here. “Socially, I have somebody to practice with and to live Irish things with when you’re over here — talk football, or Gaelic or hurling or soccer, which you miss. So it’s big for me. “Shane has dipped his toe in the water over here but the hardest thing for any European coming across here is the different culture and I think Shane loves home more than anybody else. “That will be the hardest thing for him, playing over here for four weeks in a row and what's he doing in the second week when he misses the cut, he can't fly home to see his friends back in Ireland and come back late on the Tuesday evening. “What's he going to do late in the year when he's tired and he's fed up with having played 25 events and he's missed the cut. Watch out America, Shane Lowry believes he has “gained the respect” he feels he deserves in the US and will be ready to “come out all guns blazing in January” to improve on his memorable 2015. 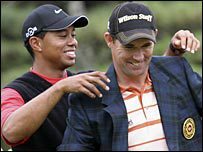 Padraig won't let precious opportunity pass by: "If I had to have a crutch and a little seat to sit on between shots I’d be playing"